I always hesitate to use the word sleeper because readers often associate that word with no-name fantasy football players. I prefer the word "undervalued." As a drafter, this is what I am always looking for: value. If I can get a 3rd round value in the 6th round, it gives me a significant relative advantage over my opponent. The following players (e.g. Ezekiel Ansah) most people have heard about and really aren't considered "sleepers." However, this doesn't mean they can't provide just as much relative value as a no-name player that comes out of nowhere. In this article, I recommend five players at each of the 3 defensive positions (DL, LB, DB) who I believe will be significantly undervalued heading into the 2014 fantasy season. LDE Ezekiel Ansah (DET) - Ansah is perhaps my top IDP sleeper heading into the 2014 season. He was 3rd behind Robert Quinn and Greg Hardy in sacks per snap (minimum of 500 snaps) and had small bursts of time last year where he looked absolutely dominant. As long as he stays healthy, he should see an additional 100-200 snaps which should help him reach double digit sacks without much of a problem. I can see a JPP-like sophomore season for Ansah. He's a player I will be targeting as my DL2/DL3 in all my drafts. DT Gerald McCoy (TB) - McCoy finished 4th among defensive tackles with 9 sacks last season which was good enough for a top 5 fantasy finish at the position. The addition of Michael Johnson should help further boost McCoy's production and cement him as one the top DTs in the game. There is very nice upside here so draft with confidence. 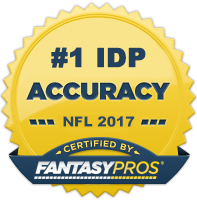 DE Jerry Hughes (BUF) - Jerry Hughes could very well be the top sleeper/value play right now in IDP drafts. The former first round pick enjoyed his first successful season last year with 45 total tackles and 9.5 sacks as an outside linebacker. He will be transitioning to defensive end in Buffalo's new 4-3 Wide 9 scheme under Jim Schwartz. Although we may see a dip in production/playing time, 7-8 sacks is a real possibility for Hughes playing opposite Super Mario which is very nice upside for a player who is currently going undrafted in a majority of leagues. ILB Wesley Woodyard (TEN) - During his six-year career in Denver, Woodyard served as the ultimate utility player. He made an impact both at middle linebacker and on the weak side and was a team captain in each of his six years on the team. However, a mid-season neck injury severely diminished his on-the-field play and the emergence of Danny Trevathan made Woodyard expendable. His signing in Tennessee makes a lot of sense - Horton's system demands linebackers to be quick and athletic both against the run and the pass. Expect Woodyard to play every down next to underachieving Zach Brown. We've seen that Tennessee is one of the most target rich environments in the league which could very well help Woodyard see a return to his previous fantasy dominance. He's shaping up to be one of the higher ceiling LB2s. ILB Mychal Kendricks (PHI) - Kendricks has been a favorite of mine since entering the league in 2012 out of California. He had an underwhelming rookie season as the speed of the NFL seemed to be a bit much for him at times. He showed similar signs during the early part of last season, but eventually turned a corner in the middle of the year and started to play more consistently and showed flashes of true playmaker potential. The Eagles fast paced offense is going to put them near the top of the NFL in tackle opportunity (they were #1 last year) which opens up the door for Kendricks to have a monster season if he can carry over that consistency into 2014. He was a bit overshadowed by DeMeco Ryans last season and his 2013 numbers don't scream elite fantasy LB1, but trust me, this kid has the potential to be a top 5-10 fantasy linebacker as soon as this coming season. One of the best value picks on the board. ILB Perry Riley (WAS) - After initially looking far apart in contract talks, Riley and the Redskins managed to come to terms in fairly quick order. $13 million was a lot less than Riley originally was asking for but I'm sure he found the market to be much less welcoming than he originally expected. He's not particular great against the run or the pass, but stands as the only viable tackle threat on the Redskins defense currently. With London Fletcher retired, there's a good chance Riley benefits greatly from the lack of tackle competition and launches himself into a LB2+/LB1- role. FS Deone Bucannon (ARZ) - Bucannon is my top ranked defensive back rookie - with Daryl Washington suspended and the Honey Badger's status unknown for the regular season, he could very well top 80 solos tackles. Look for Arizona to play the youngster close to the line of scrimmage early and often as they look to help out a shaky linebacking crew. FS Brock Vereen (CHI) - Vereen may be the biggest longshot on this list. However, recent reports have stated that the Bears "clearly like what they have seen" from fourth-round draft choice out of Minnesota. He's been receiving first team reps throughout mini-camp and will only need to hold off two very mediocre safeties in M.D. Jennings and Chris Conte. If he can lock down a starting role, the opportunity for big tackle numbers will be there playing on a defense that had a lot of trouble getting off the field last season.